Livetrak is a live web based vehicle tracking system giving unlimited users access to their fleet minute by minute from any PC suitable for fleet sizes 1-500. 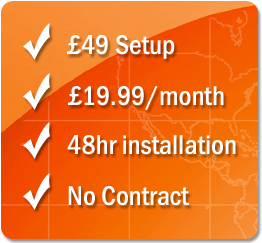 You can have a unit installed for as little as £49 - then your only commitment is the monthly rental of £19.99 which can be cancelled with 30 days notice. Unlike other vehicle tracking suppliers Livetrak are able to offer a much more flexible monthly "Pay As You Go" agreement. Livetrak are confident you will be completely satisfied with our system that we don't ask for any commitment longer than 1 month. We ask you to set up a standing order to cover the on-going monthly rentals which you can cancel at 30 days' notice and simply return the unit. All tracking units carry a lifetime warranty. Livetrak operate a nationwide network of engineers and will arrange with you the customer a suitable time and date to come and install the units into your vehicles. This can normally be arranged within 48 hours of placing your order. We also operate out of hours and weekends if required. Any number of users can access the Livetrak system at any given time from multiple locations giving you a true multiuser system. You can also link the system to large wall mounted TV screens linked to PCs with our "Map view +" screen setting.